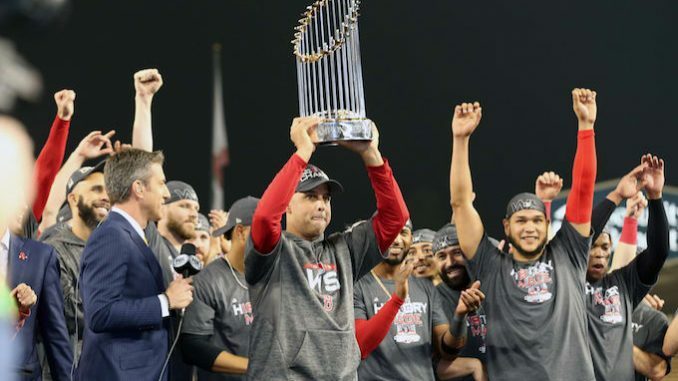 On Sunday, October 28, the Boston Red Sox beat the Los Angeles Dodgers 5-1, clinching their fourth championship in the past 15 seasons. The team was dominant throughout the year, attaining 119 wins between both the regular season and the playoffs. During the postseason, they had a record of 11-3 while playing some of the best teams in the league, including the Yankees, who had 100 wins this year; the Astros, who were last year’s champions; and their World Series opponent, the Los Angeles Dodgers. Boston only lost one game in each series, blowing past each team with dominance and defeating the Dodgers in just five games. In the first game of the series, both teams were back and forth in the first few innings. Boston took the lead on a few occasions, but Los Angeles managed to answer with runs of their own. The game was tight up until the fifth inning, where Boston took the lead and never lost it again, ultimately winning 8-4. Game 2 of the series was much closer as David Price took the mound for the Sox. Once again the game was tied going into the fifth inning, until J.D. Martinez hit a two-run single, giving the Sox a 4-2 lead, one they would hold on to for the remainder of the game. Impressively, all four of Boston’s runs came with two outs, and they took a 2-0 series lead. The third game seemed never ending and was the longest game in postseason history, lasting even longer than the entire 1939 World Series. It wasn’t until the eighteenth inning that the 2-2 tie was broken. Dodgers rookie Max Muncy decided that seven hours and 20 minutes of play was long enough, hitting a homerun that gave the Dodgers a 3-2 victory. From there, Los Angeles went into Game 4 with some momentum, taking a 4-0 lead in the sixth inning. Boston pitcher Chris Sale went on an intense rant in the dugout, which seemed to be the spark that the Red Sox needed. Shortly after their offense came to life. Mitch Moreland’s pinch-hit homerun in the seventh inning brought Boston within one run, and Steve Pearce tied the game in the eighth with a homer of his own. In the ninth inning Boston took the lead, eventually winning by a score of 9-6, leaving Boston one victory away from winning it all. Game 5 in Los Angeles featured David Price against Dodgers ace Clayton Kershaw. Boston got off to a quick start with Pearce hitting a two-run blast just three batters into the game. Price was excellent on the mound, giving up only one run to the Dodgers which came on his first pitch of the night. In the sixth inning, Mookie Betts had his first postseason homerun. An inning later, Martinez had a homerun of his own, giving him his first of the series. In the eighth, Pearce hit his second homer of the night and brought the Red Sox lead to 5-1, earning his place as the series MVP. Chris Sale closed the game by striking out Manny Machado, and the Red Sox became champions. “This is everything I’ve ever dreamed of,” said Sale after the game. It was certainly a season that Boston will never forget. Winning 108 regular season games with rookie manager, Alex Cora, marked a franchise record. Cora has World Series rings from his time as a Red Sox player and Astros coach, in addition to this one as a manager; when asked which victory was the best Cora said, “As a player I was just a utility guy, and last year I was a bench coach. This feels better.” The MLB regular season lasts 187 days and Boston spent 173 of those days in first place. Not only did they lead the league in wins, but they also led in payroll. Their $230 million helped provide the team with enough talent to be champions. When asked about their latest World Series title, Red Sox owner John Henry claimed he had never seen anything like it. “They were just relentless throughout the season,” said Henry, “It was their unity and sense of purpose.” Based off of their long list of accomplishments, Boston’s World Series victory seems like the perfect ending to this MLB season.